BATTLE GROUND — Google is calling attention to how Battle Ground Public Schools’ teachers (BGPS) use technology in the classroom. The school district has become the fourth in the Pacific Northwest region to earn the distinction: Google for Education Reference District. Reference Districts are those that have demonstrated excellence and leadership through the innovative use of technology to drive impact and positive learning outcomes. It means that Battle Ground will be a resource for other districts looking to adopt Google educational technologies. 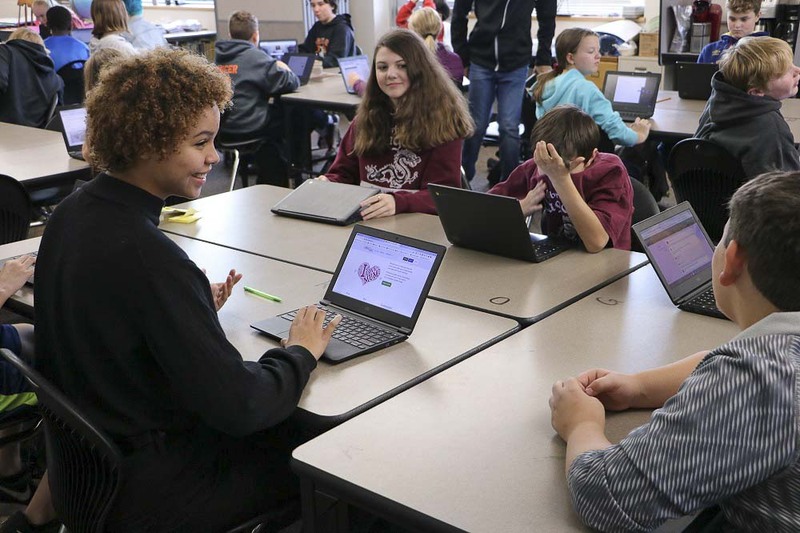 In Battle Ground schools, students use Chromebooks that are checked out to them for the school year to complete a variety of assignments on applications such as G Suite for Education, also known to students as Google Classroom. Angela Minick, a seventh grade teacher at Daybreak Middle School, is taking full advantage of the opportunities afforded by having student Chromebooks and the full suite of Google educational apps. Minick and her team developed an in-depth book study program that uses several interconnected programs like Google Forms, Slides, YouTube, and more. The kids start by working within Google slides as an introduction to the concepts from the book that they’re studying. Then, in between reading sections of the book, students find links to character study videos on YouTube, look up vocabulary words, and access their assignments quickly and conveniently. As one of its technical education initiatives, BGPS continues to roll out its 1:1 computing initiative that will put a Chromebook into the hands of every student in grades 3-12. The program launched in January 2017 with seventh grade students and was expanded this year to include all 6th-9th grade students. Each student in these grades has been assigned a new Chromebook to use not only during the school day, but also to take home with them throughout the school year. Students are responsible for their device just as they would be for a textbook, and the computer is theirs to use for as long as they attend a school within the Battle Ground district, excepting summers. Eventually, every student in grades 6-12 will be assigned a Chromebook for take home use. Students in grades 3-5 will be assigned a Chromebook for use in class. The district provides support to teachers through trainings and mentoring on how to seamlessly integrate technology into the classroom and best educational practices. Battle Ground, which adopted Google technologies district-wide just six years ago, joins a trio of Pacific Northwest school districts — Eatonville, Sumner and Edmonds — who have also earned the Google for Education Reference District designation. As a reference district, BGPS will serve as a resource for other districts that are considering adopting Google’s G Suite for Education and regularly host workshops, classroom trainings, IT roundtables, and conference presentations. In fact, McDaniel is presenting best practices for using Google’s educational technologies in the spring alongside representatives from the company at an annual conference for IT professionals. Information provided by Battle Ground Public Schools.